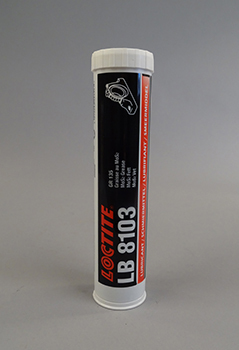 LOCTITE LB 8103 is a universal mineral grease containing MoS2 for heavy duty use on moving parts at all speeds. LOCTITE® LB 8103 is used in high stressed joints, plain and roller bearings, splines and socket joints, and slideways subjected to vibration and heavy loads. This product is typically used in applications with an operating range of -30 °C to +160 °C.